The 'Encyclopaedia of Indian Temple Architecture' comprises a vast research on the architectural features of Indian temples spread all over the Indian subcontinent. 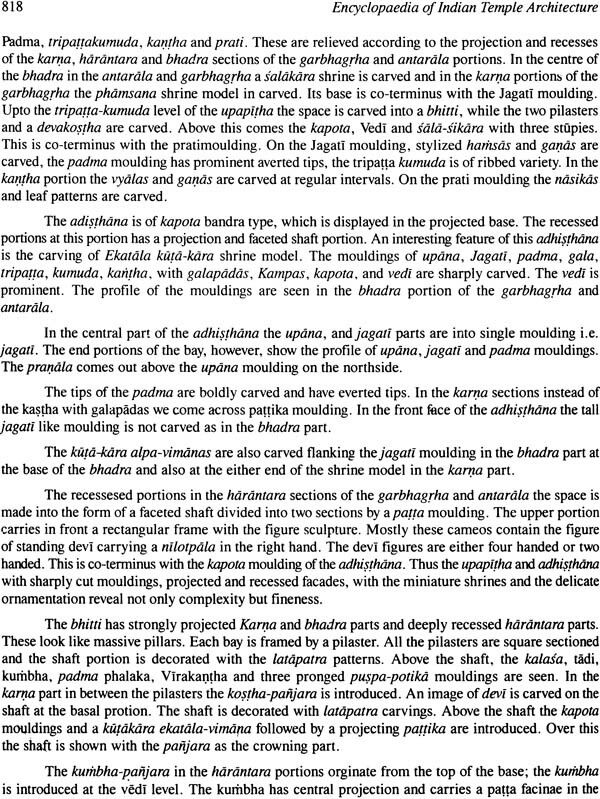 This encyclopaedic study is divided into forty- five chapters which delineate the various characteristics of temple architecture starting from the Gupta period (4th C.A.D.) to the Kashi Visvanatha temple rebuilt by Rani Ahilyabai of Indore (1776 A.D.). The work begins with an insight into the Indus Civilization that flourished in the Indus Valley region (now in Pakistan) with the two most important sites of Mohanjo-daro and Harappa revealing a marked degree of controlled urban planning. As for the temple architecture, the Imperial Guptas had established their sovereignty over almost the whole of northern India and the regular building of structural temples in brick and dressed stone started in their regnal period. The period under their immediate patronage fully deserves the name 'The Golden Age' of Indian art and culture as aesthetic principles of architecture, sculpture and painting were formulated in their region. 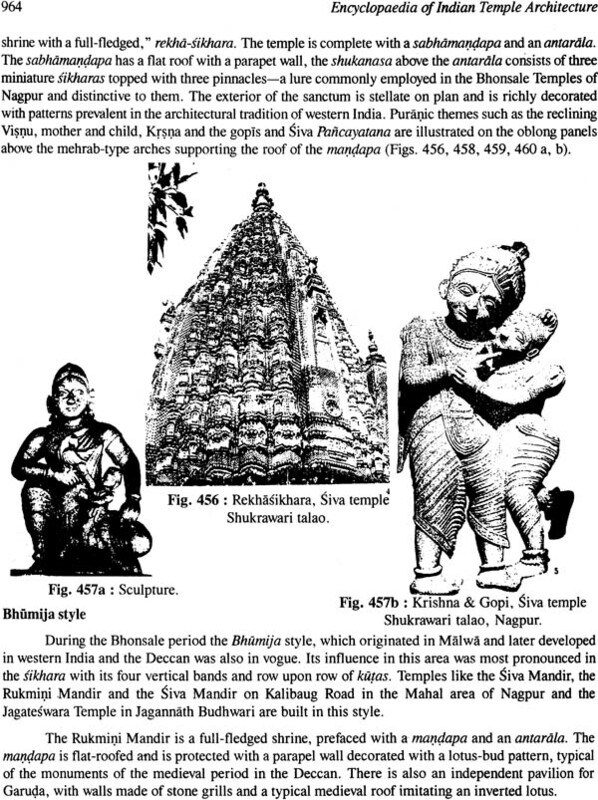 The Hindu temples evolved during that period with the basic features of the cella, the mandapa and the vestibule. The temples of Post-Gupta period studied here indicate that most of the characteristic features of north Indian temple architecture, including the curvilinear superstructure (sikhara) and the repeated motifs extending from the niches of the wall had been developed. The beautiful architecture of the valley of Kashmir cannot be denied. The great temple of Elephanta is formed of a species of hard trap-rock about 4.5 miles in circumference. 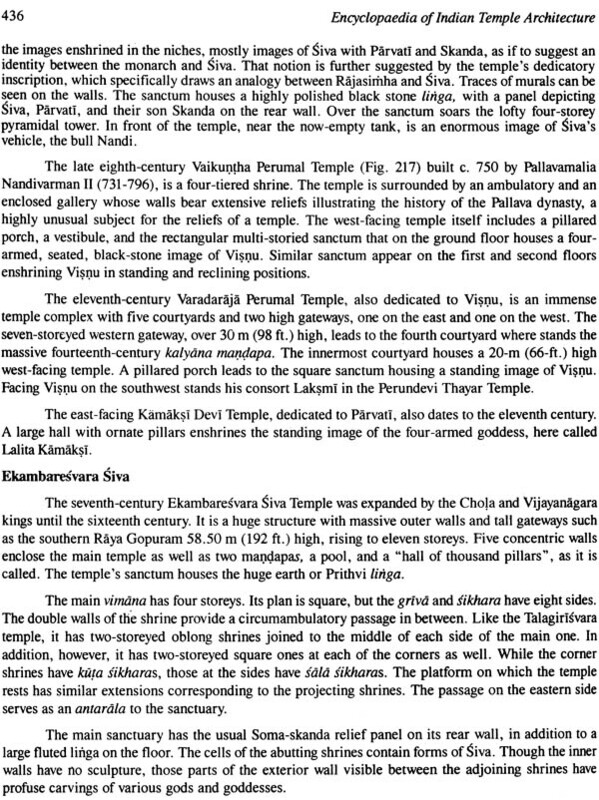 The Shore-temple at Mammallapuram and the temple of Kailasa is the most sublime monument at Ellora. The Chalukyas of Badami (500-757 A.D.) laid the foundation of stone architecture in Karnataka in the towns of Badami, Aihole and Pattadakal. 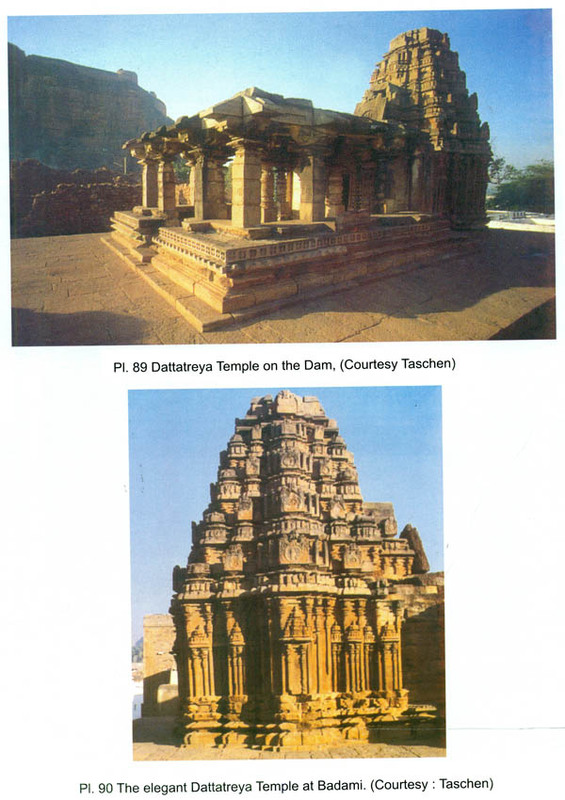 The Pattadakal is known as 'cradle of temple'. The other dynasty rulers followed their different style, and named their own style as Chalukyan style, Rastrakuta style, Hoysala style and Vijayanagara style. The Rastrakutas of Malkhand (757-763 A.D.) were enlightened rulers and their period witnessed a steady increase in the construction of Kalyana (973-1198 A.D.) contributed hundreds of temple of Siva, Visnu and good number of Jinalayas of architectural eminence. 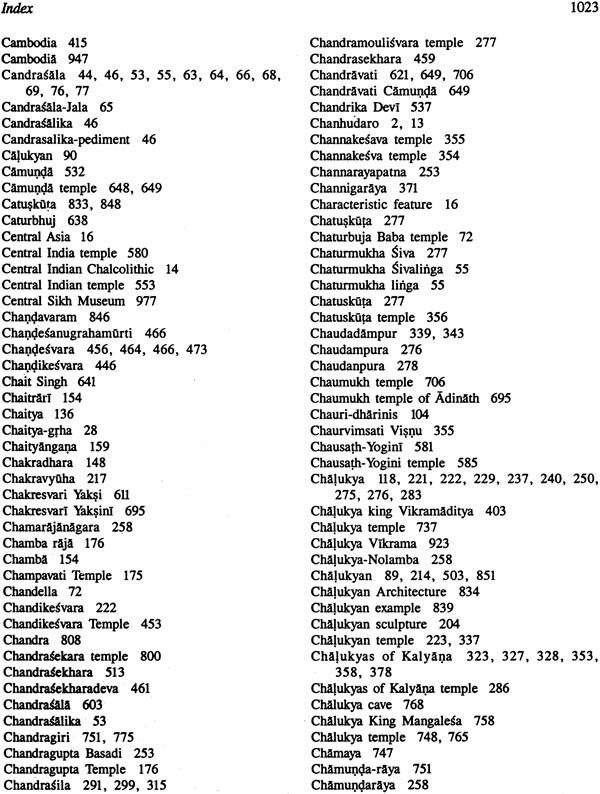 The Hoysalas of Dvarasamudra (1000-1346 A.D.) constucted more than hundred temples and basadis. 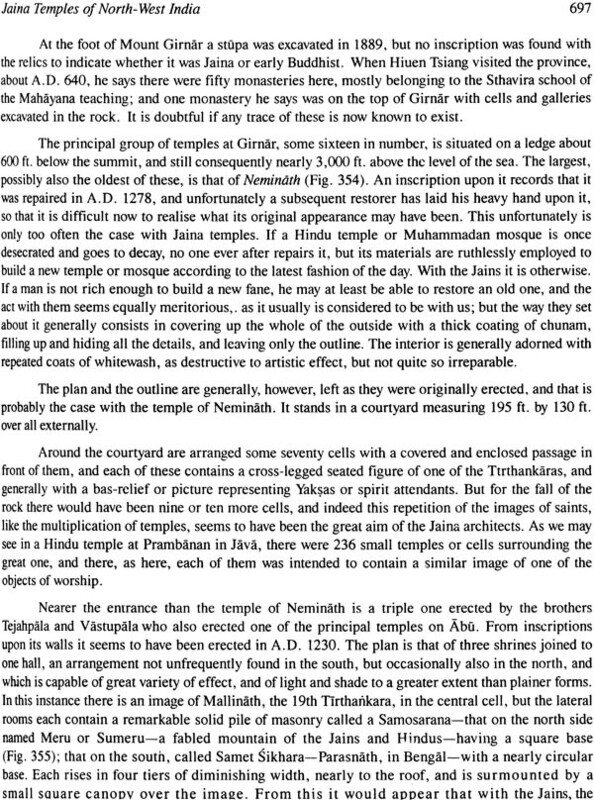 The Pallava rulers (600-900 A. D.) were responsible for patronage of extensiverock-cut works at the seaport city of Mamallapuram. The rock-cut temples known as the five rathas reveal the rich variety of south Asian architecture. 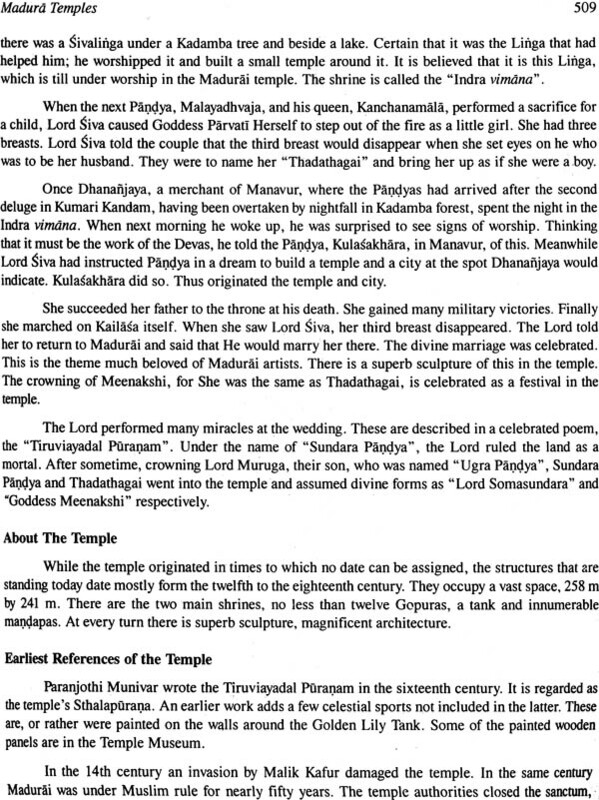 The Cholas became chief power after Pallavas and built magnificent temples. The Pandyas (1150-1350 A.D.) gained supremacy in the south when the Chola dynasty collapsed in the 13th century. The book shows that there was tremendous progress in traditional temple styles as witnessed from Orissan temples (800-1200 A.D.). 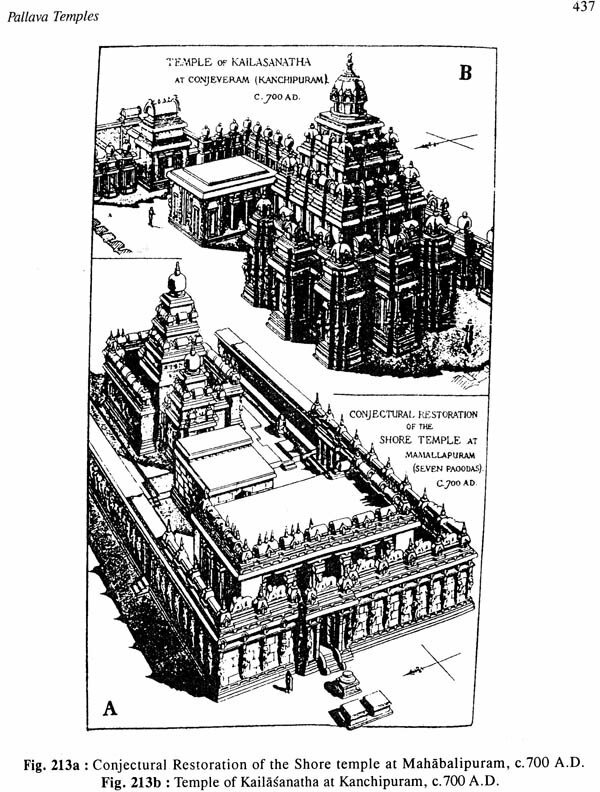 The temples of central India evolved from the northern Nagara type (6th cen.) to distinctive central India style (8th cen.). 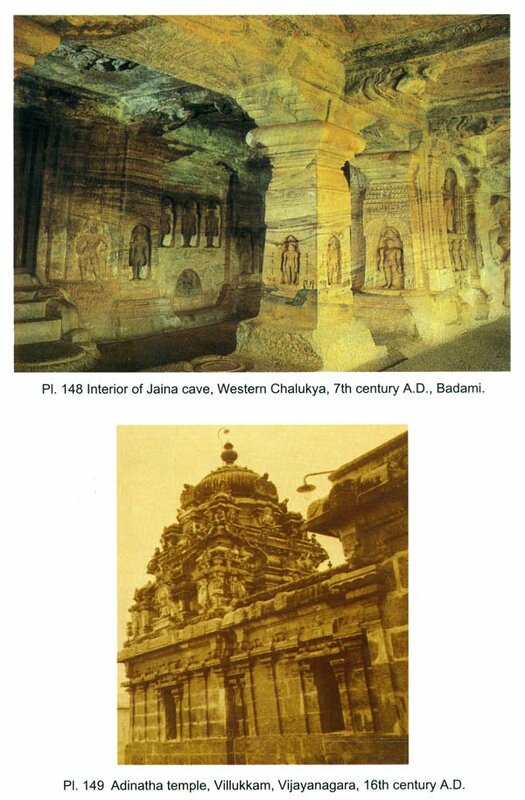 The construction of temples proliferated in Rajasthan simultaneously with Orissa and central India but Muslim invaders mutilated them beyond repairs. 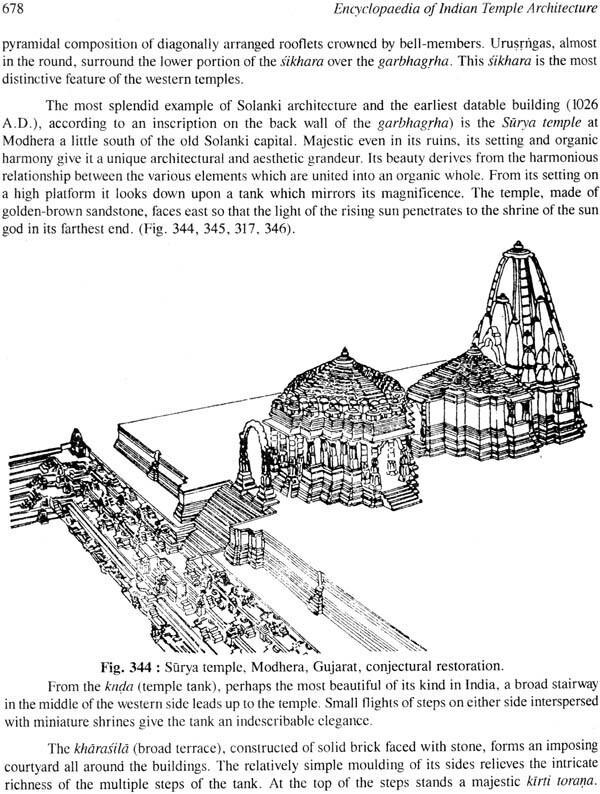 Gujarat temple architecture developed in richest temple building in North India under the Solanki dynasty. 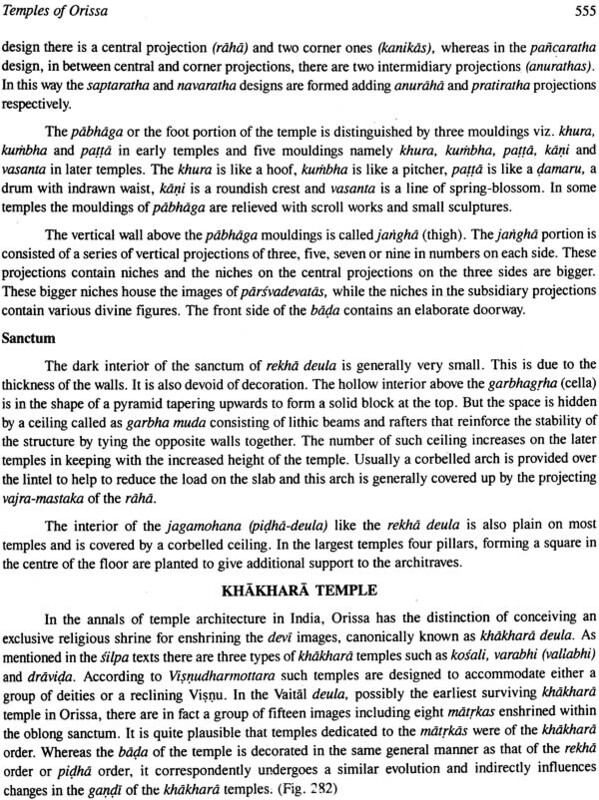 Jaina temples spread in South India are detailed. The book explores the Hindu and Jaina rock-cut temples which came in effect under the patronage of Chalukyas and the succeeding Rastrakutas and the contemporary Pallavas. An outline of the Vijayanagara temples at Lepaksi is a notable example of the vijayanagara style of architecture. 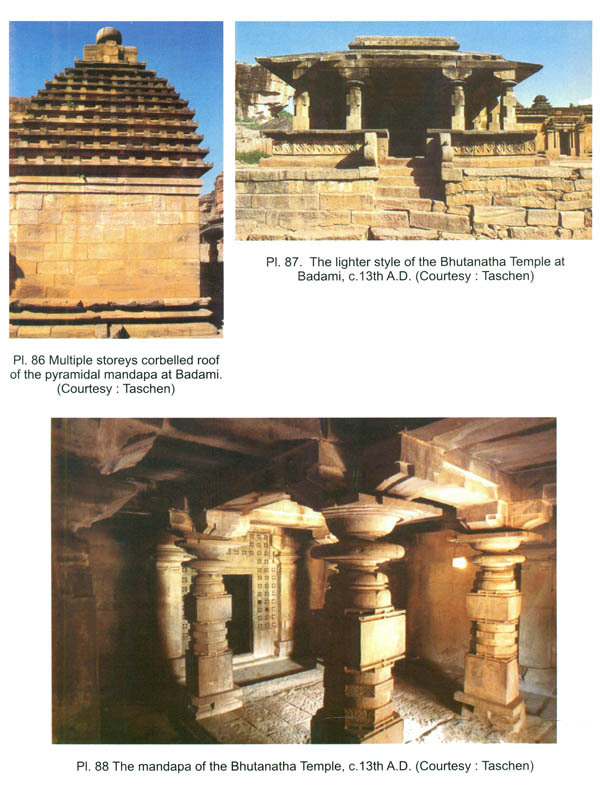 The book further deals with the architectural style of the Kakattya temples of Andhradesa. 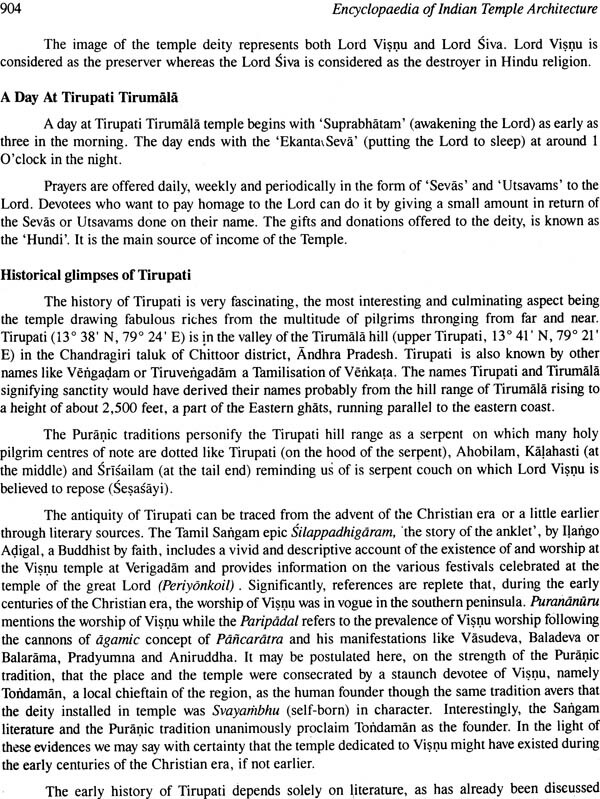 Besides the study of various temples of south India, the book focuses on the Brahmanical temple of Bengal. 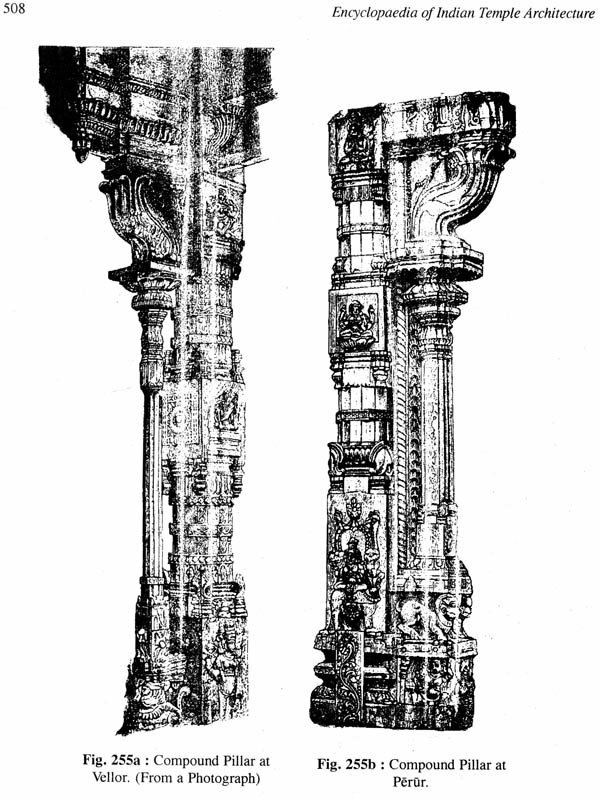 The building of Maratha temple was discouraged under Muslim rule for a period of three centuries. 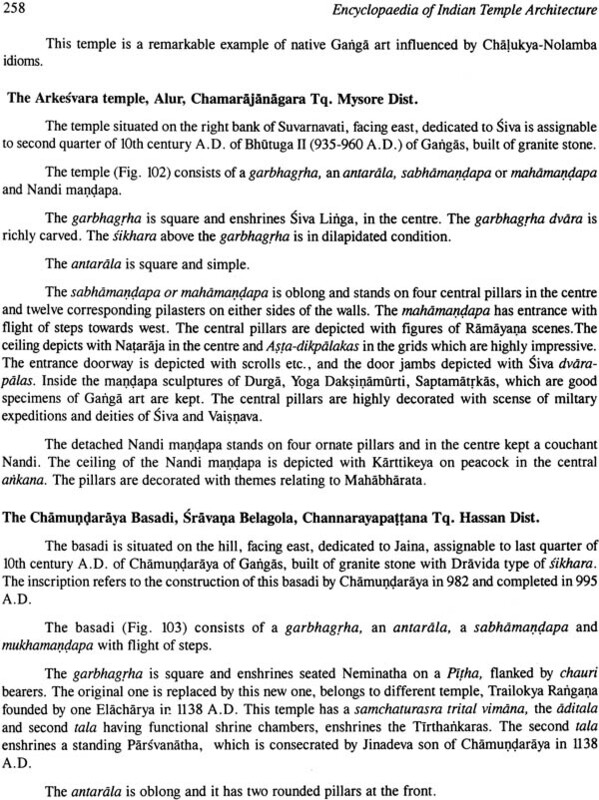 However, the religious and funerary temple of Nagpur were greatly favoured under Sivaji. The ancient city of Pratishan on the bank of the river Godavari is remarkable for the Hindu temple and monasteries. At last the book deals with the Golden Temple at Amritsar and the religious temples of Varanasi and other temples. The work is further embellished with the inclusion of about 300 coloured plates beautifully printed on art paper and enriched with about 450 plans of the different temples. Dr. K.M. Suresh (Born 1952) former Registrar and presently working as Director (Museum) in the Kannada University, Hampi in Karnataka, obtained his M.A., from Karnataka University, Dharwar in 1974 and P.G. 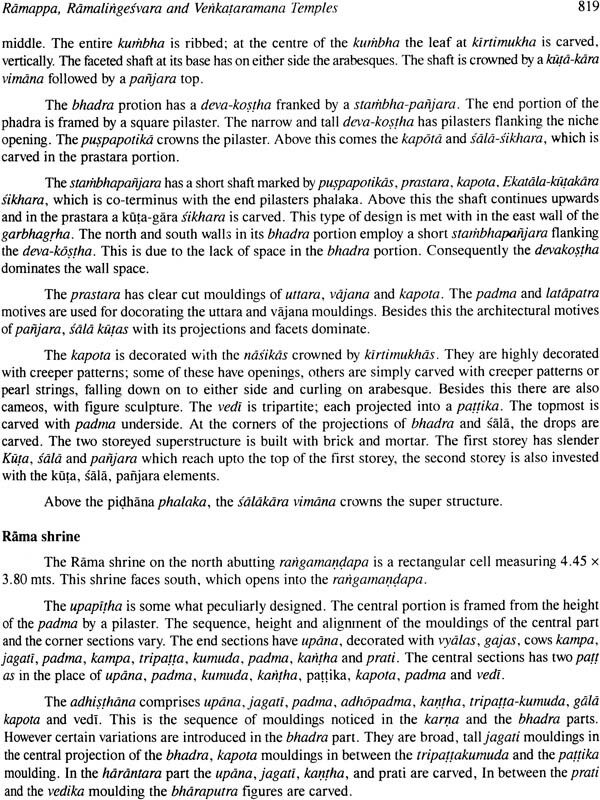 Diploma in archaeology from Institute of Archaeology, Archaeological Survey of India, New Delhi in 1986. He obtained Ph.D. 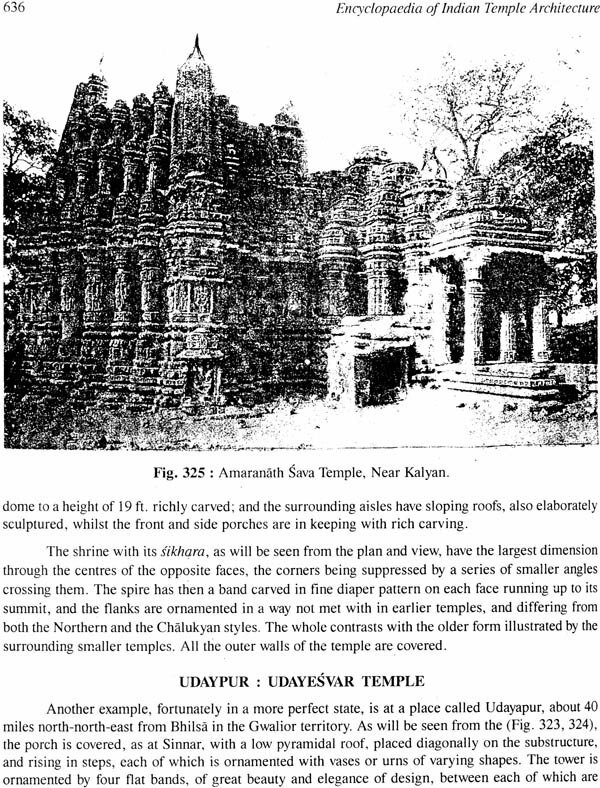 Degree from Utkal University, Bhubaneswar, Orissa in 1992 on "Sculptural Art of Hampi- Vijayanagara". Since his inception in the Archaeological Survey of India from 1976 to 1996, he served in various capacities in the Archaeological Museums at Bijapur, Hampi, Aihole and Badami in Karnataka and Khajuraho in Madhya Pradesh. He has been active field worker and excavator in the Excavations Branch IV of Archaeological Survey of India, Bhubaneswar in Orissa. 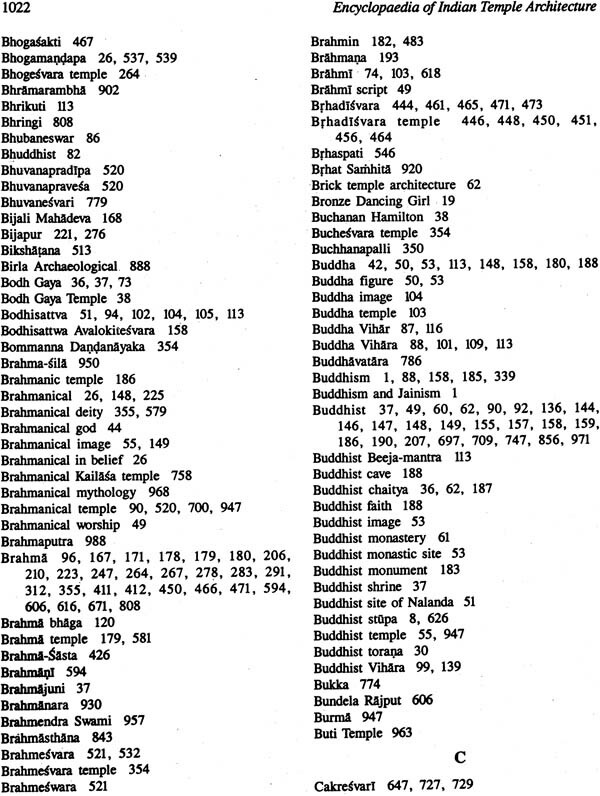 He has published several books on temple architecture and sculptures. He is member of many academic societies and guide to Ph.D. and M.Phil, scholars in the Kannada University, Hampi and examiner for other Universities. Dr. N.C. Panda, Reader in Sanskrit, Vishveshvaranand Vishvabandhu Institute of Sanskrit and Indological Studies, Panjab University, Hoshiarpur. After graduation from Utkal University and Post-graduation and M.Phil. Degrees from Kurukshetra University, he obtained Ph.D. degree in Vedic Studies from Panjab University, Chandigarh. 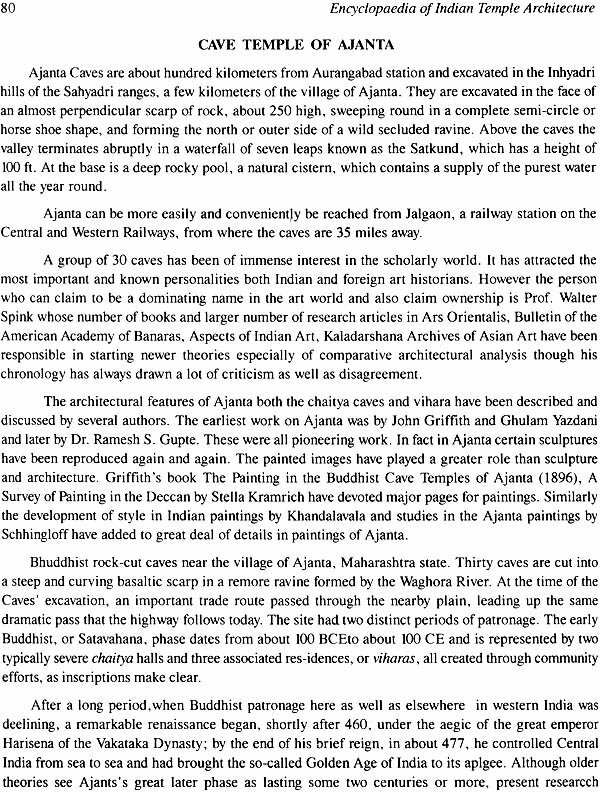 In addition to these Dr. Panda also qualified in other Indological branches like Buddhism (Acharya), Kashmir Saivism (M.Phil. 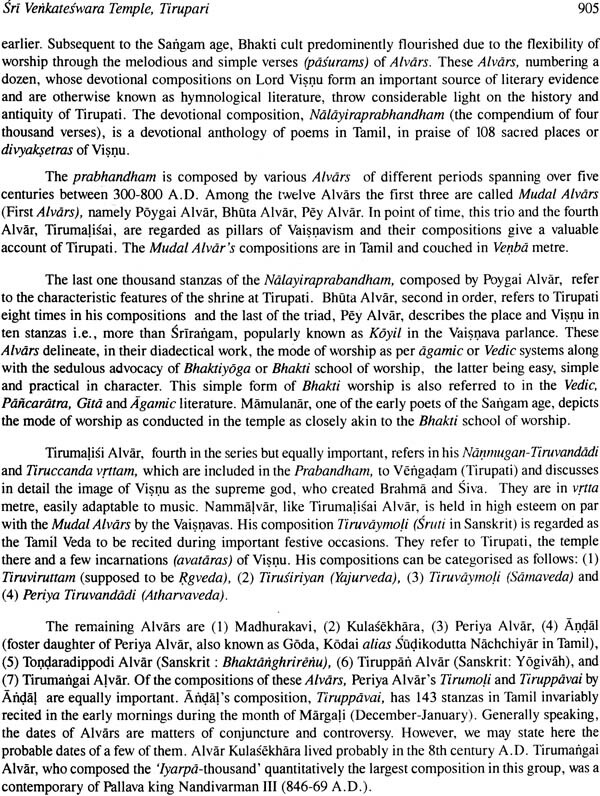 ), Indian Philosophy (Acharya), Ayurveda Ratna and C.C. in German. Dr. Panda is the Joint Editor of Vishveshvaranand Indological Research Journal. Siva Nagi Reddy, born at Valiveru in Guntur District in 1955, underwent a 4 years training in Traditional Sculpture arid Architecture at Tirupati. He did his M.A., in Ancient Indian History, Culture and Archaeology from Osmania University. He was awarded the Degree of Doctor of Philosophy for his outstanding thesis on Evolution of Building Technology in Early Andhradesa (Upto the 14th century A.D.) from the Hyderabad Central University in 1995. He is associated with a good number of reputed and research organisations like the Indian History Congress, A.P. History, Academy of Art and Architecture, Archaeological Society of India, Indian Institute of Vastu etc. At present he joined in National Institute of Tourism and Hospitality Management, Hyderabad, A.P. as Sthapati. 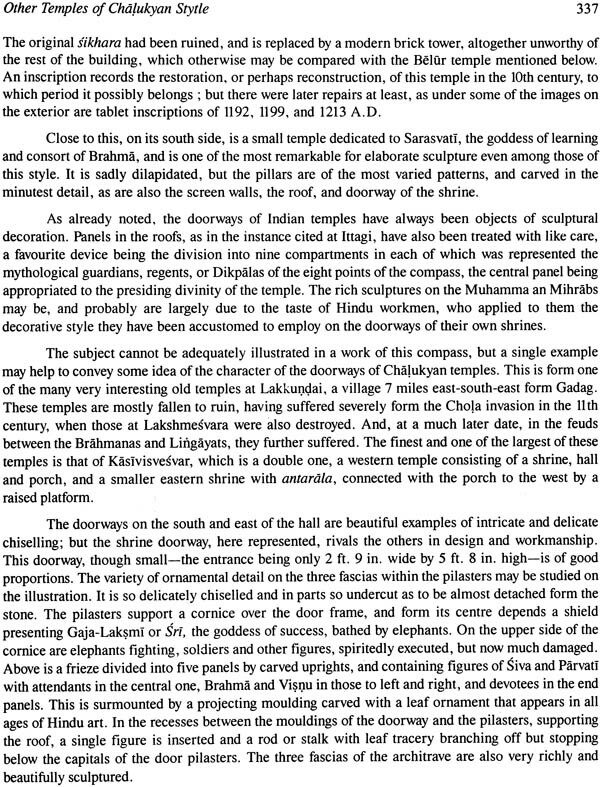 The present ‘Encyclopaedia of Indian Temple Architecture' consists of a number of researchful material on the architectural features of Indian temples contributed by well-known scholars of India. The work begins with an introduction to 'Indus Civilization' that flourished in the Indus Valley region (now in Pakistan) in the 3rd-2nd millennia BCE. The two most important sites-Mohenjo-daro nd Harappa-reveal a marked degree of controlled urban planning that reached the height of their development between 2600 and 1900 BCE. The architectural features include the great Bath in the citadel at Mohenjo-daro, with its central rectangular water basin surrounded by small chambers, and the elevated platforms divided into smaller squares by narrow passages. They were found at both as for Mohenjo-daro and Harappa and tentatively identified as granaries. Although the written records of the Indus Civilization remain undeciphered, the Great Bath and granaries may have had some religious purpose. The Harappan Civilization or the Indus Valley came to light through unexpected archaeological discoveries from 1924 onwards at Harappa in the Punjab and Mohenjo-daro in Sind. The most striking feature of the excavated sites of Harappan Civilization was the perfection of its town planning according to a master plan. These cities were built up directly as urban centres planned as integrated units. On the west of both cities-Harappa and Mohenjo-daro-rose the citadel with fortified walls enclosing big buildings, probably used for some public royal or religious purposes-assembly halls granaries, baths and what may have been some form of temples. The building materials and methods of construction show remarkable uniformity. The drainage and water supply system also showd a great advance. According to Sir Mortimer Wheeler this excellent sanitation system is unparalleled in pre-classical times. The high standard of town planning and sanitation, with sufficient water supply and drainage system, makes the Indus Valley or Harappan Culture outstanding among all the ancient cultures. Mohenjo-daro, a modern Sind word meaning 'place of the dead', lies in the Larkhan district of Sind. The general plan of the city is almost identical with that of Harappa. The chief buildings in the Mohenjo-daro citadel is the so-called great bath, a complex of verandahhs and rooms ranged around the sides of a rectangular pool. A pillared verandahh surrounded all from sides of the pool, with rooms beyond. To the west of the great bath there was the granary, a structure of immense significance says Sir Mortiner Wheeler. 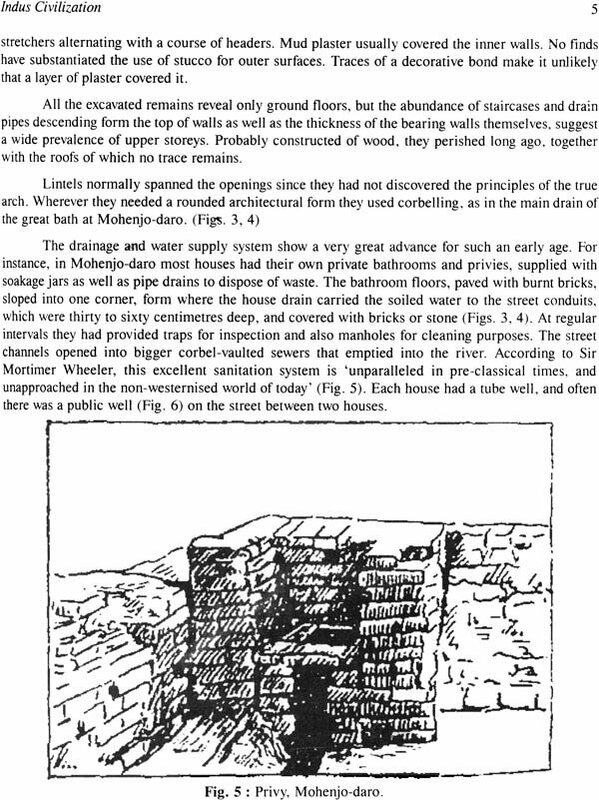 The discovery of this structure strengthens the view that in a Bronge Age economy, granaries correspondend to state banks or treasuries. The overall picture presented by the great bath, the imposing granary, the so-called college and the assembly hall inside a well-fortified encircling wall indicates a stable seat of power. Discovered by Majumdar (1931) and excavated by Macay, Chanhudaro lies about 129 kms south of Mohenjo-daro. It has no citadel but the city plan follows the traditional grid, with burnt-brick houses and well-planned drainage. In 1957, EA. Khan discovered the Harappan site of Kot-Diji, a small town with a fortified citadel east of Mohenjo-daro. More than eighty-five sites of the late Harappan period have been brought to light after a large scale archaeological survey of Sourashtra and Gujarat. Lothal discovered by S.R. Rao (1954) situated at the head of the Gulf of Cambay flourished as a seaport and follows the traditional scheme of a citadel raised on a higher level. The Harappan phase shows characteristic features like the use of a standardized Indus script, engraved seals with unicorn and other animal motifs and standardized weights and measures as well as common styles of pottery ornaments, figurines and distinctive form of artistic expression. 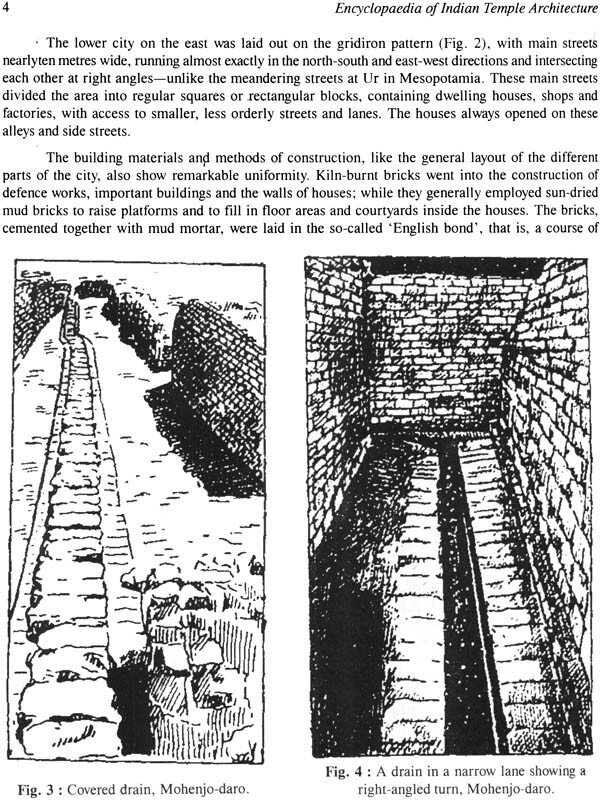 Architectural features of baked-brick buildings, lined drains and wells are almost indentical to those seen at other Indus sites, such as Mohenjo-daro. Harappa was connancted by trade to distant regions like Central Asia, the Persian Gulf, and Mesopotamia Mohenjo-daro an ancient city, one of the largest urban centres of the Indus civilization consists of numerous mounds spread over 25 h lac where more than 80000 people may have lived. It comprises multi-storeyed houses constructed from fine brick on massive platforms. It seem that a class of wealthy merchants lived there. 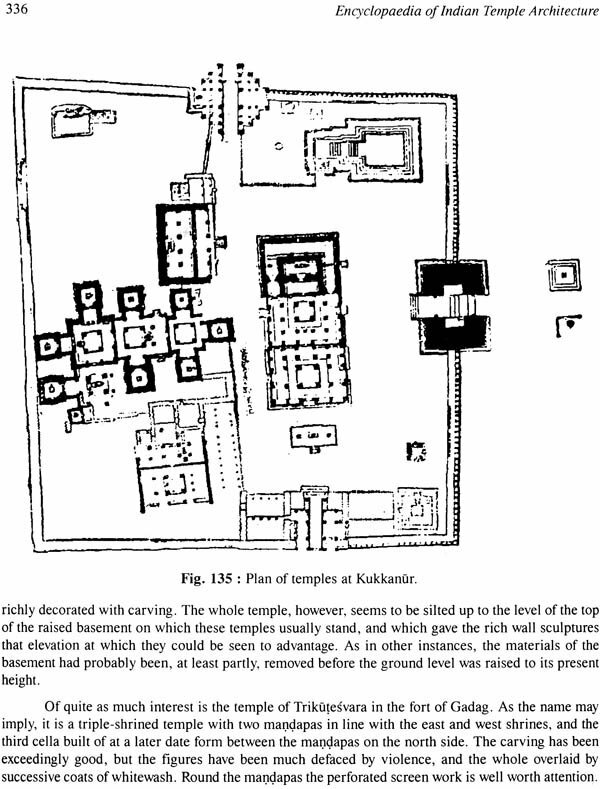 At Kalibangan, the pre-Harappan settlement, like its Harappa successor, was fortified. Excavations at Rakhigarhi revealed some interesting evidences of defense system adopted by the Harappans. And in other cities of the Indus Valley Civilization, the excavation in Dholavira in Kachchh district of Gujarat was discovered in 1967-68. It revealed a major urban habitation that was well planned with roads running at right angles, buildings of special fine bricks, a simple and utilitarian architecture and an advanced system of water storage and management. 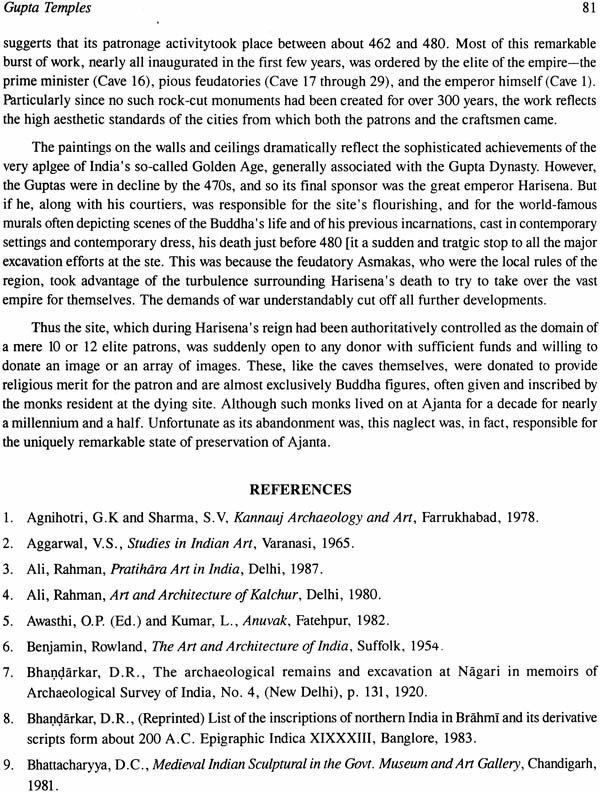 It was the most important Harappan site in Indian subcontinent ideally suited for a settlement having fortifications. 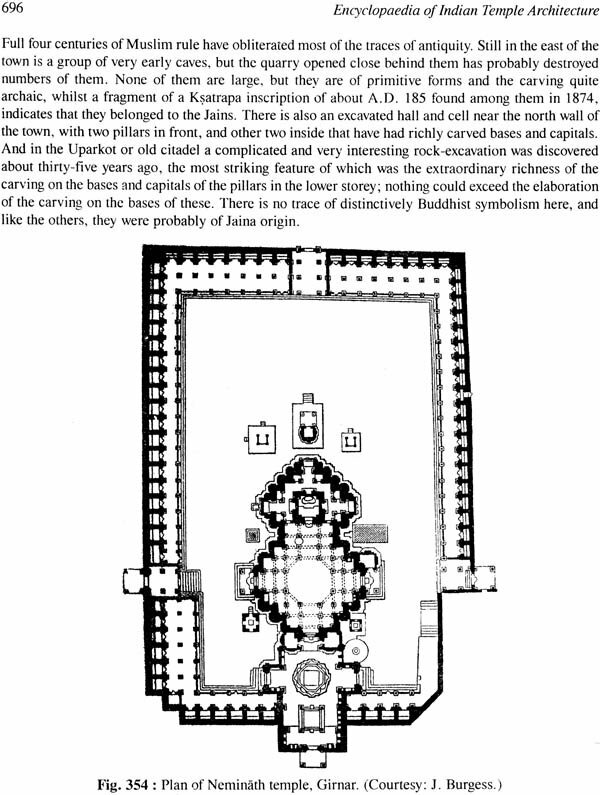 The second chapter reveals that it was by the first quarter of the fourth century A.D. that the Imperial Guptas had established their sovereignty over almost the whole of northern India and the regular building of structural temples in brick and dressed stone started in their regnal period. We can trace a clear and continuous chronological record of the political history of India. The country enjoyed unbroken unity, peace and prosperity during their rule of more than two centuries. They gave inpetus to the renaissance of Hinduism. They ushered in a resurgence of cultural activity and heralded India's greatest efflorescence. A high watermark was reached in all phases of art, science and literature. Gupta ideals served to inspire generations long after the empire had perished. The period under their immediat patronage fully deserves the name 'The Golden Age' of Indian art and culture as aesthetic principles of architecture, sculpture and painting were formulated in their region. 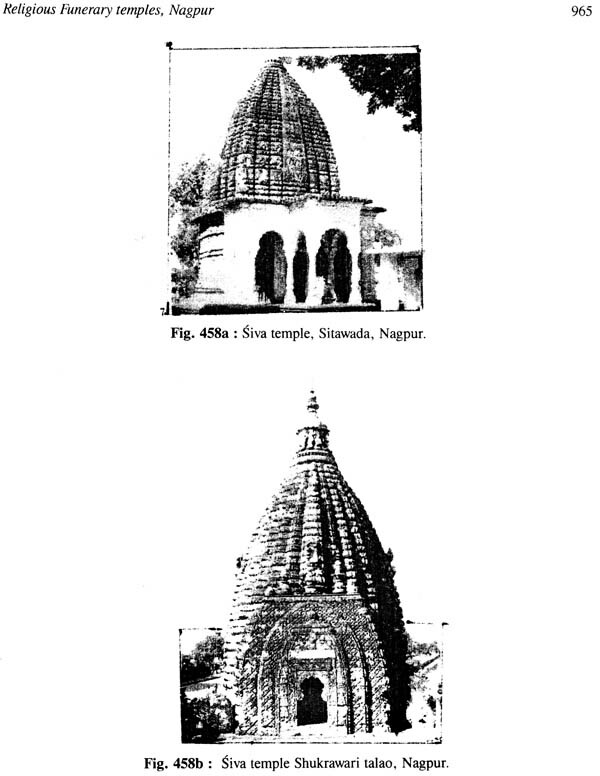 Small structural shrines had been erected prior to the Gupta age belonging to the Mauryan period (3rd century B. C.). 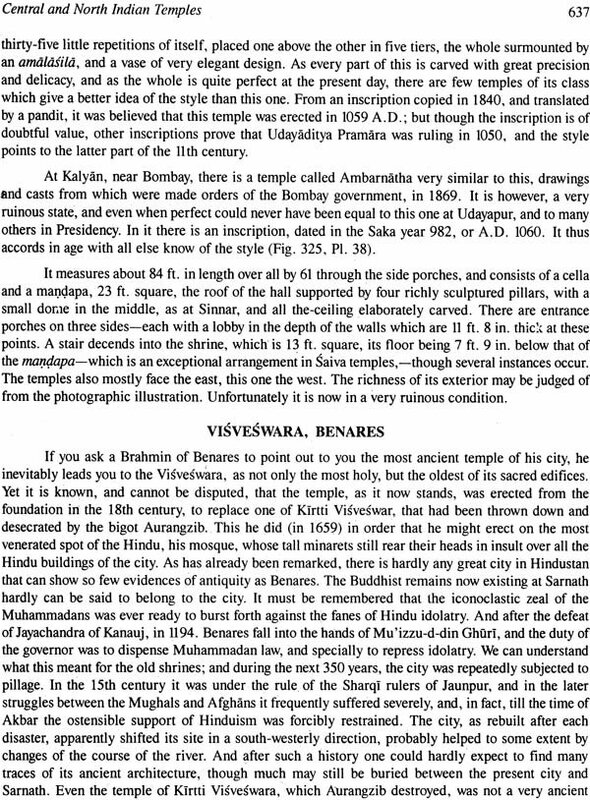 It was the one at Bairat as well as the two elliptical structures at Besnagar and Nagari and temple No. 40 at Sanchi. The inscriptions of the Gupta period reveal that the Hindu temples evolved during that period. Since this age marked the beginning of structural temples, a great number of them were erected and experiments in different types were made. 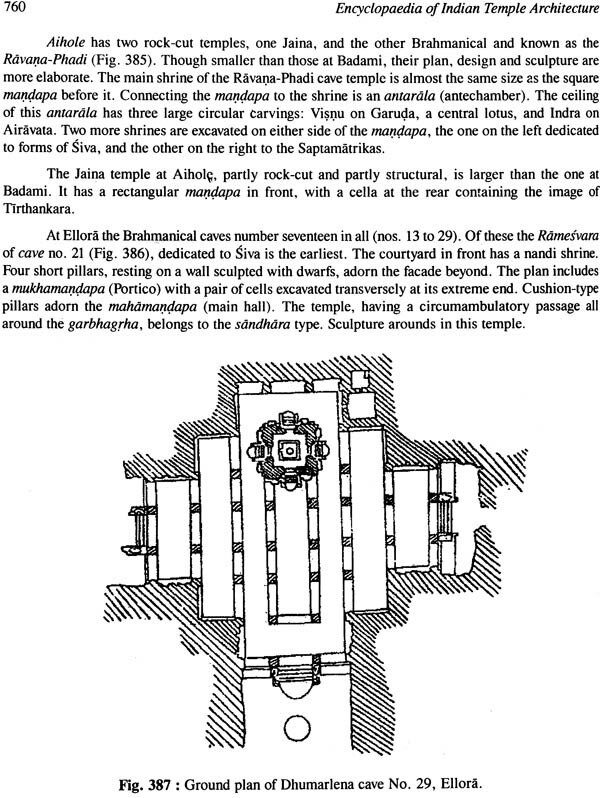 The basic one consisted of the Cella (garbhagrha), the mandapa and the vestibule (antarala). An innovation of great significance was the use of dressed stone in building construction in the field of architecture. The architects grappled with the fresh problem of stability proportion and balance instead of imitating the wooden prototypes. 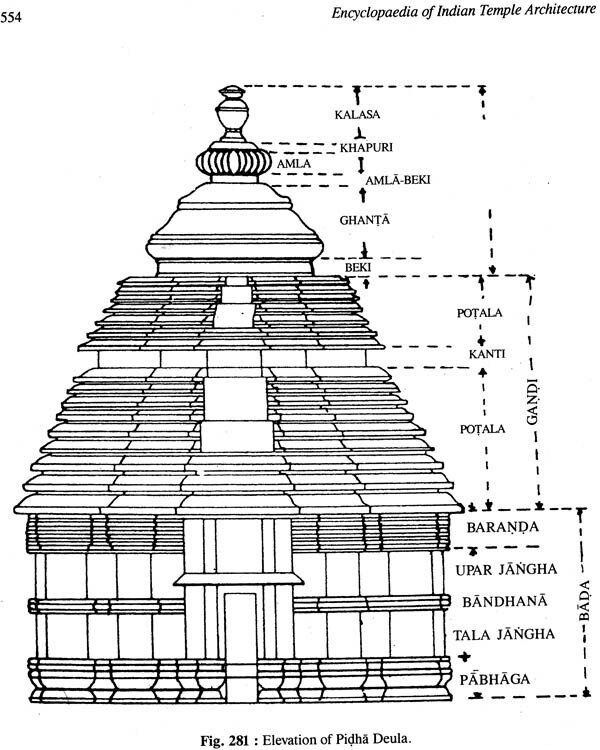 The Gupta temples show variety of types and forms-the most popular ones consist of a plan square flat roofed garbhagrha (womb) to house the image of the deity and a low pillared mandapa in front to shelter the devotees. 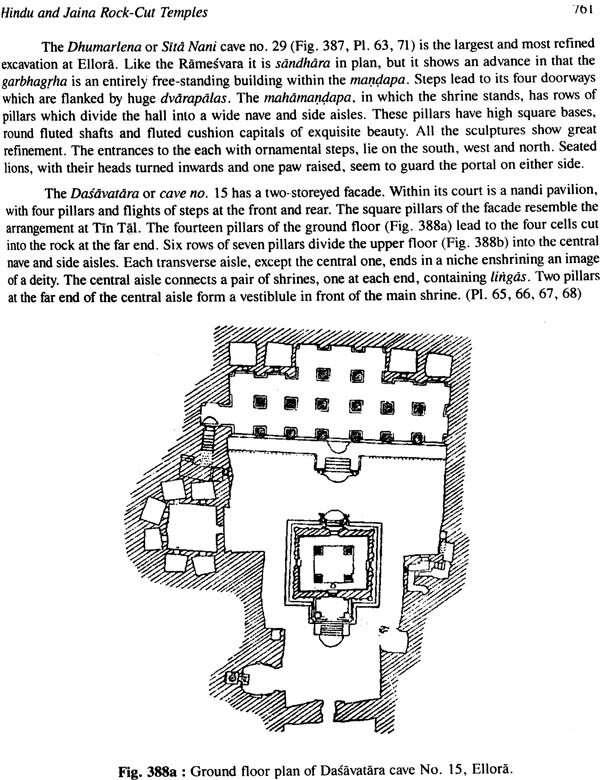 Gupta temples may be classified into different groups: the first square and flat-roofed with a shallow porch in front, like temple No. 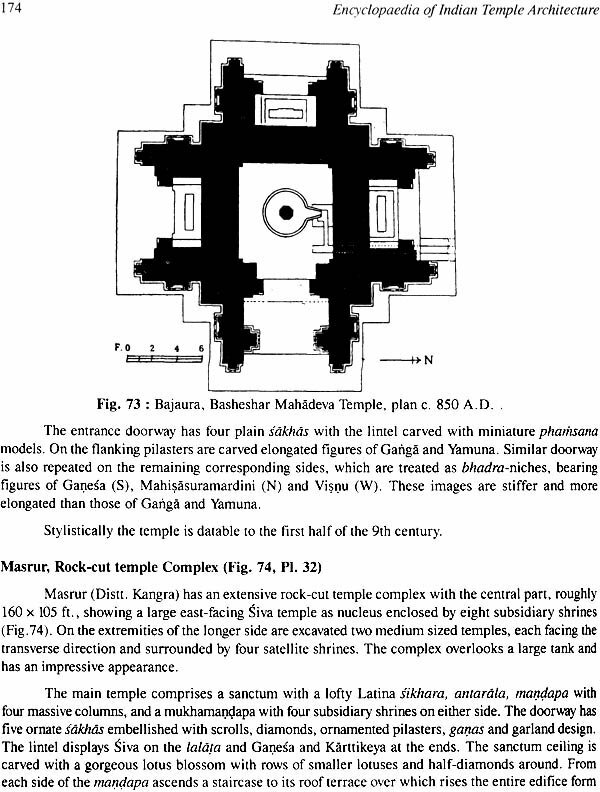 17 at Sanchi; the second, with a covered ambulatory all around the cella, a very good example being the Parvati temple at Nachna Kuthara, the third, with a short sikhara above the garbhagrha, such as the brick temple at Bhitargaon and the Dasavatara at Deogarh. Temple No. 17 at Sanchi provides a good example of the early Gupta style with a plain square cella fronted by a pillared verandahh. The Temple of Kankali Devi at Tigawa in Jabalpur district, probably the earliest instance of the true Gupta order, has vase-like capitals called Puma- Kalasa (bowl of plenty). The Temple of Visnu and Varahi at Eran, similar in plan proportions, probably belong to a somewhat later period. The importance of the Parvati Temple at Nachna Kuthara in the Panno district lies in addition of the covered pradaksina path (circumambulatory passage) around the garbhagrha. The Dasavatara temple at Deogarh in the Jhansi district, dating from the fifth or early sixth centuries exemplifies the final form of the basic Hindu temple, reached towards the end of the Gupta period. Many shrines continued to retain the prevailing plan of Buddhist chaitya halls. 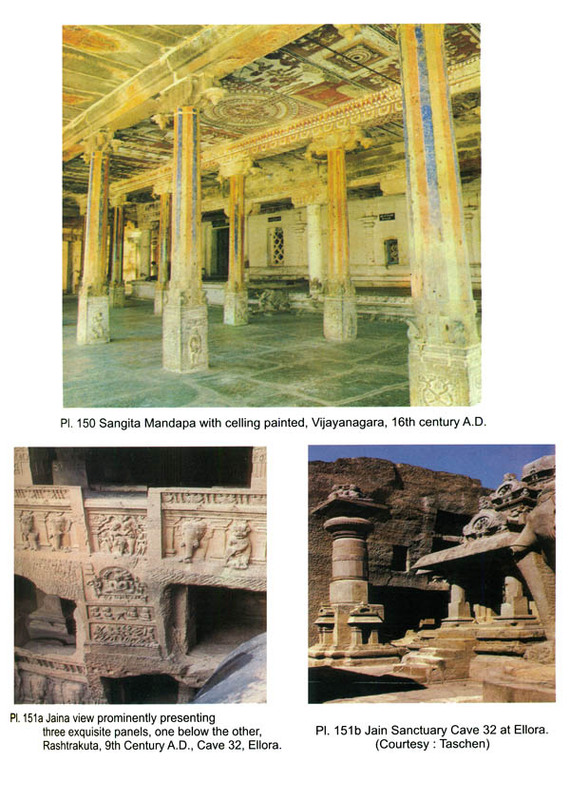 Some chaitya halls later transformed into Hindu temples. 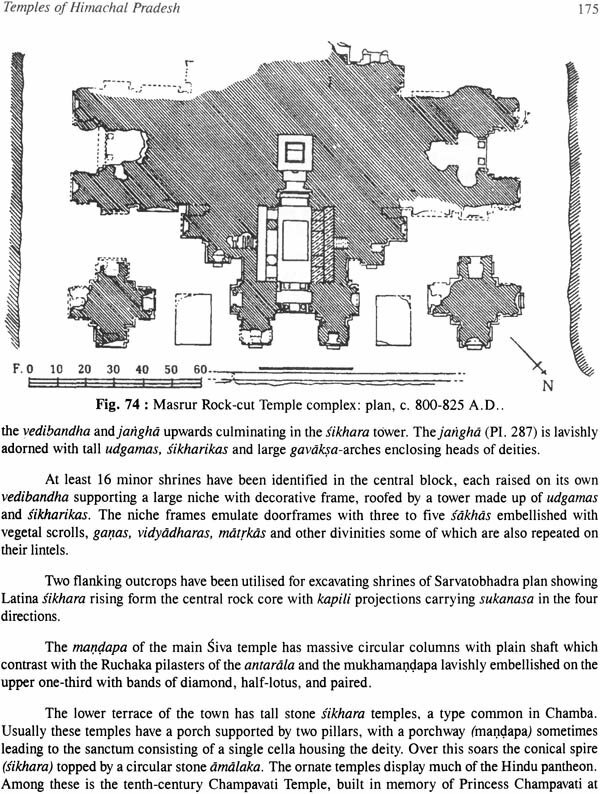 In dealing with the temple architecture during the Gupta period, mention must be made of the shrines made of brick. The most important of these brick temples are the Bhitargaon in Kanpur district, the original Mahabodhi temple at Bodh Gaya, and the Laksmana temple at Sirpur. Bodha Gaya has the Visnupad-temple built in the 18th century. Six miles south of Gaya is the great temple of Bodh Gaya, one of the holiest places in the world, and the most sacred of all places to Buddhists. Asoka built a monastery and a temple here at the place where Buddha attained enlightenment. The Siva Temple at Bhumara, Distt. Satan enshrines an impressive Ekamukhalinga. The Siva Temple at Sakar in Damoh (MP) has affinity to the Bhumara temple. The Vamana Temple in District Jabalpur has a large Vamana image with other images and is similar to Bhumara Temple in elevational aspect. Then there are-other temples like the Siva temple at Darra in Kota and Udaygiri caves, terraced Visnu temple at Pawaya (Gwalior), Lauriya-Nandangarh-a Buddhist site in north Bihar, Siva Temple at Ahichhatra in Bareilly, the excavated brick and stucco stupa at Mirpurkhas in Sindh, the Maniyar Math in Magadh, site 3 at the Buddhist site of Nalanda, Stone Temple No. 2 at Nalanda, Visnu temple of Aphsad, Mundesvari Temple at Ramgardh meant for the worship of Mahisasurmardini etc., mostly exceptional in plan. Dah Parvatiya near Tejpur (Assam) has a brick temple of Siva of the Ahom period. 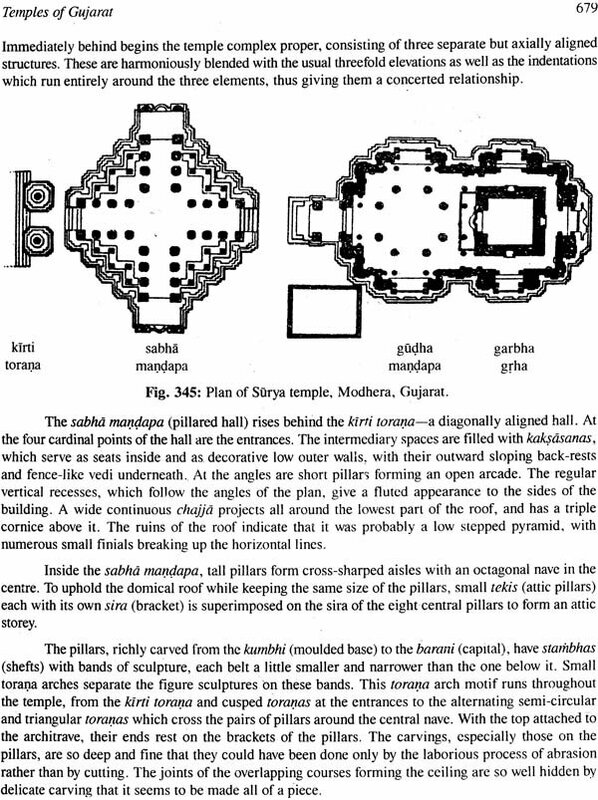 The Chaitya-hall makes its appearance as a free standing temple of permanent materials in the Gupta period, eg. a shrine at Chezarla in Guntur. As for the brick temples of lower Ganga- Yamuna Duab, the earliest evidence was found from Basenagar at Vidisha (M. P.) and Nagari district Chittor (3rd-4th c. BC)-developed in late Mauryan age. The construction activities of brick temple architecture reached its climax during Gupta period (c. 319 A:D-578 A.D.) which were reported from Dah-Parbatia (Assam), Sharkot (Sindhi), Mirpur Khas (Sindh), Bhitargaon (Kanpur), Bhitari district (Ghazipur), Ter in Andhra Pradesh and Mandhol in Nagpur. Several brick temples were constructed at Nagari, Mansar, Bhitari, Bhitargaon, Sirpur, Mirpurkhas, Devinmori, Dhahparbatia and Fatehpur during the Gupta- Vakataka age. Tower type profile is typical characteristic of Nagar style of Gupta period temple of Bhitargaon and similar structure style of brick temple of Vakataka period early 5th century A.D. was recently exposed by A.K. Sharma and J.P. Joshi at Mansar. Architecture style at Mansar Siva-Vaman brick temple of early 5th century A.D. has towering profile with recessed corner in ground plan. This temple style is identical with Bhitargoan and Sirpur brick temples. 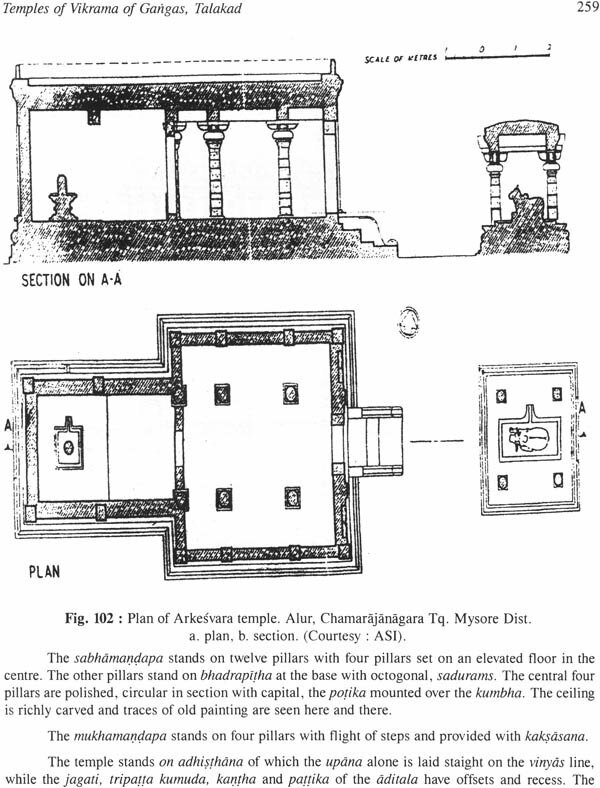 Vakatakas architecture (4th-5th century A.D.) shows models of such temples at Ajanta. Two brick temples of Sarhan Buzurg lie in Ananti at Jahanabad Road.